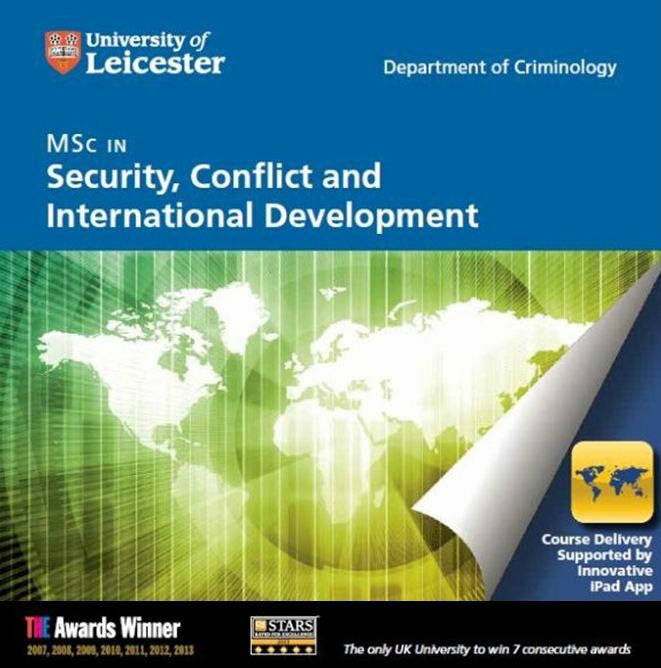 The MSc in Security, Conflict and International Development (SCID) offered by the University of Leicester (UoL) is an innovative distance-learning postgraduate degree programme which focuses on how to meet the strategic security and justice challenges of countries emerging from conflict. 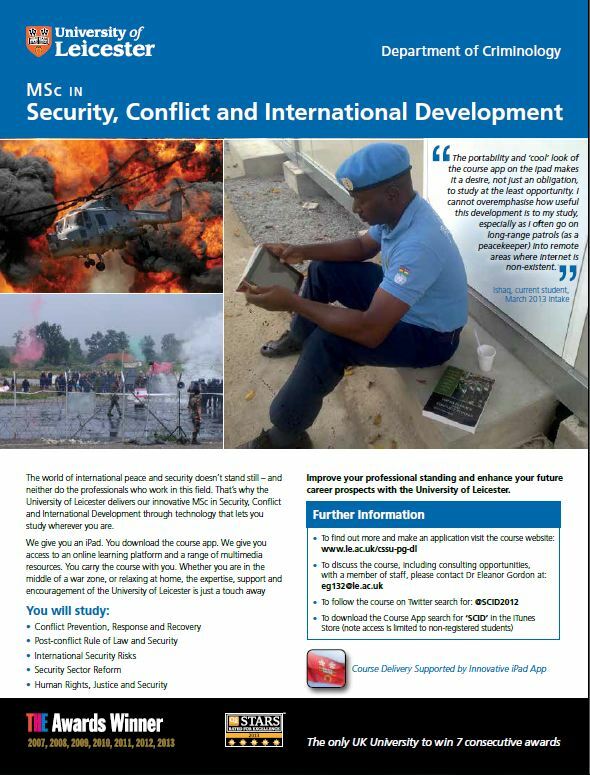 To provide context, a significant part of the course addresses other aspects of post-conflict recovery, as well as conflict prevention and the risks to wider regional and international security posed by conflict-affected and conflict-vulnerable environments. The course is designed specifically for those working – or hoping to work – in international development. The course is delivered by a bespoke App, as well as via an online platform, which means that students can continue to study while on the move and in environments with little or sporadic Internet access. The course is also multi-media rich to create a dynamic learning experience. The SCID Course is supported by a Panel of Experts, comprised of over 80 leading international experts in the field of conflict resolution, management and transformation. The decision to establish the SCID Panel of Experts was made in order to further enhance the learning experience and expose students to the knowledge and views of a broad range of international experts. In particular, it was considered important to bridge the divide between academia and the practical field, not least because the Course endeavours to equip its students with the knowledge and skills to pursue a career in the field of post-conflict recovery and wider international development. Ultimately, it is hoped that by bridging the gap between academia and the field, efforts to understand and better respond to the challenges posed by conflict can be enhanced. Members are also invited to provide informal guidance to students on subject-specific matters and related to pursuing a career in their field. It is hoped that membership of the Panel will be rewarding to Panel Members as well as the students and staff of the course, in terms of being part of a broader community of experts that are keen to share information on building security and justice in post-conflict environments.